How can I reuse or recycle newspapers? | How can I recycle this? How can I reuse or recycle newspapers? John and I prefer the ‘reduce’ option when it comes to newspapers and choose to read our news online most of the time. But every now and then, we buy a paper to read on a journey or over lunch, or get a free ad-rag shoved through the letter box. It seems a shame just throw them in the green bin once we’re done – but aside from keeping a few around for temporary dustsheets, we don’t have that much use for them. Reduce: Read the news online and if you really want to read a specific article offline, you can print it out (double-sided, draft quality) – printing out an article a day will still save a lot of paper compared to buying a full newspaper filled with bits you might not read. Reuse: Use them with vinegar to clean windows and mirrors, press them into logs for the fire or pots for seedlings, or use them to “bulk out” heavy soil or compost. 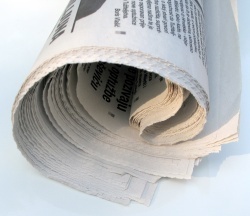 Recycle: Newspapers are widely accepted in doorstep recycling bins and at local household waste centres. Scrunched up, my newspapers go in the compost bin. Esp with “greens” such as just mown grass. Helps stop the bin getting too soggy. Glossy magazines are certainly a no-no. You shouldn’t have too much of a problem with composting newspaper :-). Most newspaper uses soy ink, since it is cheaper. 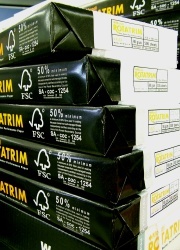 Soy ink is biodegradable, and the ‘paper will probably tell you in a corner or the bottom if it is printed with soy ink. I don’t recommend crumpling the newspaper if you’re going to put it in the compost bin. It takes longer to decompose that way. I also shred paper to use as bedding for the piggies which may get added to compost or used as mulch. I also use the hay and guinea pig poo on potatoes to mulch they suppress weeds and scar as an extra boost feed. Coffee grounds I collect from my local Starbucks and use them mostly on the onion beds as they really help with fungal disease I just keep adding to the mulch. Sometimes I just fork strips of soggy newspaper into the soil too, to break it up if the soil is too heavy with clay. hi sara, the compressor contraption, where do i get one? If yer grow runner beans, line the bottom of the trench with wet soggy newspaper – helps to retain the moisture. Bev, I have clay soil too – does your trick really work..?? It’s hard to say since I always put it in when I’m generally digging the beds over and throwing in new compost. I shall have to do some “clinical” trials! This is very good way to use the newspapers and especially for runner beans as they need a lot of water and it definately works, my mother did this 20 years ago – ahead of her times obviously!!! We use them as a throw-away cleaning rag. Handy for cleaning up cat vomit (or worse). Newspaper is also better for cleaning windows with than cloth as it doesn’t leave lint behind. Agree with John, when combined with potatoes and vinegar you get super clean glass. Most newspaper is OK to compost, since it uses soy ink, which is biodegradable. When I see an article I know a friend would enjoy, I make sure to keep it until the next time I give that friend a present – then I use the paper as the gift wrapping. 6 layers of paper makes an excellent insulator. Tile in the winter is extremely cold, and if you did it systematically you could tape down a layer of papers that would not only make your feet warmer, but possibly lower your heating bill. I’d recommend taping a thin rug down over the paper, if only for traction and appearance. I might be an over-usage of tape, but it’s just an idea. If you’re creating a new bit of garden bed, a thick layer of newspaper stops weeds coming up. If you feel like investing in a shredder, shredded newspaper makes great mulch for gardens too (helps retain water and keep roots cool in summer, stops roots getting too cold in winter). I find putting the newspaper layers down then covering them with grass clippings is good – stops it blowing about and looks nicer. Really works for weeds, especially between rows of veg as it doesn’t last forever and it noticeably improves the soil quality once the worms have had their say. You can mulch right up to the stalks of courgettes etc, then you don’t get loads of small weeds using the bigger plant as a shelter. shredded or torn newspaper makes a great edible bedding for the red wriggler worms that recycle your kitchen waste. Just soak well, squeeze out and mix with some soil, add worms and voila! The worms love coffee grounds and filters and tea bags too. If you have no garden (second-floor flats tend to do that to you! ), do try papier-mache – you’ll be amazed at the things you can make, and how durable and sturdy it can be. Tip: If you’re in London and travel on the Tube, nab as many copies of the Metro/London Lite/thelondonpaper or any other paper as you think you can handle to recycle, use for mache, use in your garden, whatever. It’s free, it’s reusing and if you don’t take ’em, they’ll only sit on the train ’til the depot and be thrown away! Lookee here: http://news.bbc.co.uk/1/hi/england/london/6747565.stm – you’ll be doing your bit and getting something you can use! You can buy cute little plant-pot makers that take a rolled strip of newspaper and turn them into a little plant pot suitable for seedlings etc. it’s better than buying peat pots, and good for things that don’t want longer root-systems (eg sweet peas, which prefer empty loo rolls). We should sell these to traders who sell these to reusing councils where the paper is de-inked using the bleaching process,chlorinating process etc. Most animal shelters will gladly take newspapers. They use it in multiple ways. I have taken old newspapers and made “new paper” out of them — usually for gift wrap, or book covers. You tear up the paper into fine little bits, put them in a basin of water, then “screen them” — that is, take window screen nailed to a wooden frame the size and shape you want your paper to be, and scoop the paper bits out of the water until you have an even layer about as thick as you’d like it. Lay the new layer of paper on a drying rack for a day or two. The water usually washes out some of the ink. 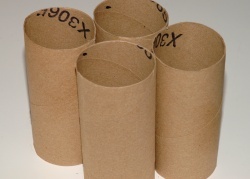 This is also a great activity to do with children who are fascinated to see how paper is made. Might want to check with your local animal shelter. Our neighborhood collects used newspapers and delivers them periodically. They are always appreciative. works better than paper towels. just make sure you let the paper absorb the liquid first. The idea of taking the papers to a shelter is a good one! I also use newspapers in crafts, such as papier mache. Great way to get rid of newspapers, and then have something else that can be art. convert newspaper waste into recycle bag. you can donate it to the local butchery,shops to use them as wrappers but for the meat u must use a polythene bag first before you use the newspaper i have another idea but ul just have to wait and check it out in my website when its up. About the ink on newspapers; a few posters have mentioned that it’s not toxic – does this apply to coloured ink on newspaper photos – is this also safe to use on compost, in trenches etc. Best substitute for packing peanuts. Paper mache is an option, or find a way to give it to a buddy who, say, wakes up later than you. oh are you really looking for a way to recycle newspapers?? i bet you will like my idea.